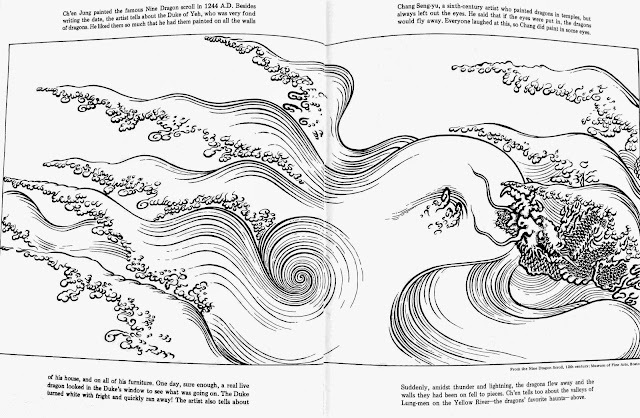 Traditionally, Chinese artists depicted water using intricate rhythmic line designs to show waves and movement. Imagine a dragon swimming in this ocean. "From its origins as totems or the stylized depiction of natural creatures, the Chinese dragon evolved to become a mythical animal. 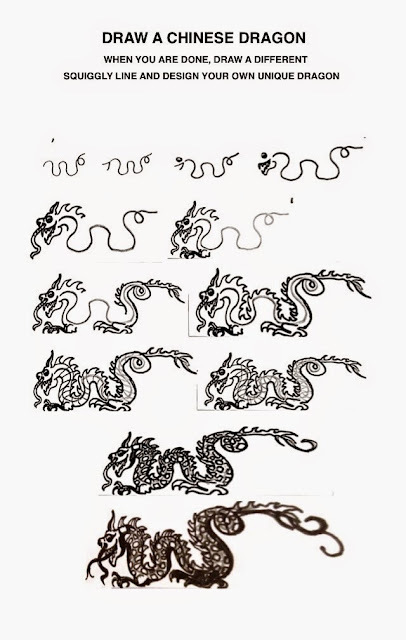 The Han Dynastyscholar Wang Fu recorded Chinese myths that long dragons had nine anatomical resemblances. 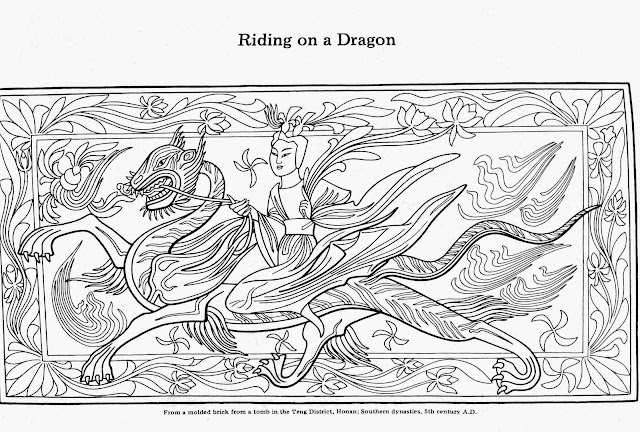 "The people paint the dragon's shape with a horse's head and a snake's tail. 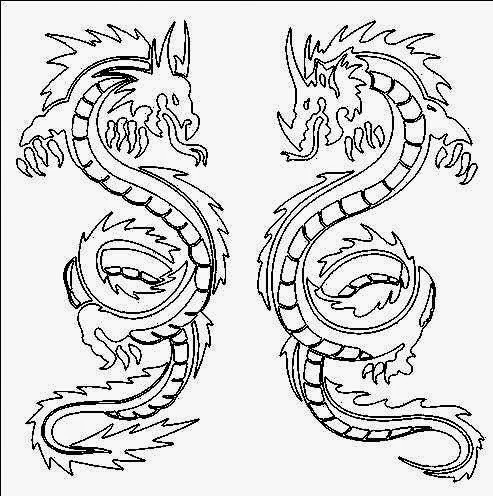 Further, there are expressions as 'three joints' and 'nine resemblances' (of the dragon), to wit: from head to shoulder, from shoulder to breast, from breast to tail. 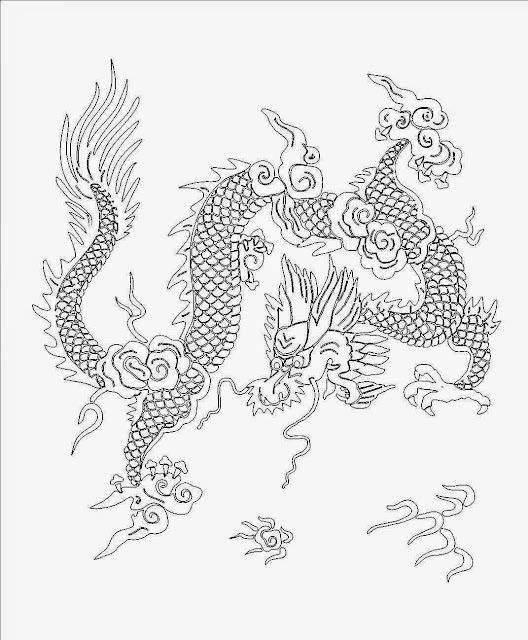 These are the joints; as to the nine resemblances, they are the following: his antlers resemble those of a stag, his head that of a camel, his eyesthose of a demon, his neck that of a snake, his belly that of a clam (shen, 蜃), his scales those of a carp, his claws those of an eagle, his soles those of a tiger, his ears those of a cow. Upon his head he has a thing like a broad eminence (a big lump), called [chimu] (尺木). 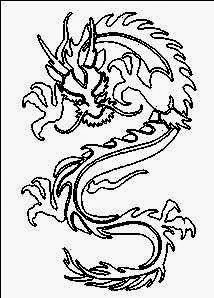 If a dragon has no [chimu], he cannot ascend to the sky." Further sources give variant lists of the nine animal resemblances. 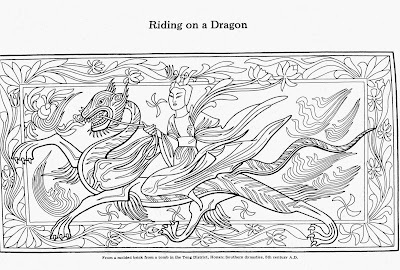 Sinologist Henri Doré lists these characteristics of an authentic dragon: "The antlers of a deer. The head of a crocodile. A demon's eyes. The neck of a snake. A tortoise's viscera. A hawk's claws. The palms of a tiger. A cow's ears. And it hears through its horns, its ears being deprived of all power of hearing." 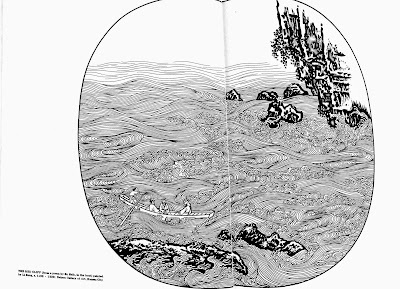 He notes that, "Others state it has a rabbit's eyes, a frog's belly, a carp's scales." The anatomy of other legendary creatures, including the chimera and manticore, is similarly amalgamated from fierce animals. 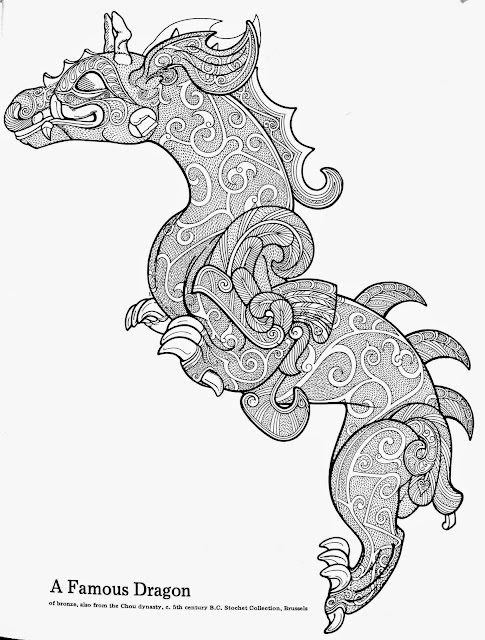 Chinese dragons were considered to be physically concise. Of the 117 scales, 81 are of the yang essence (positive) while 36 are of the yin essence (negative). 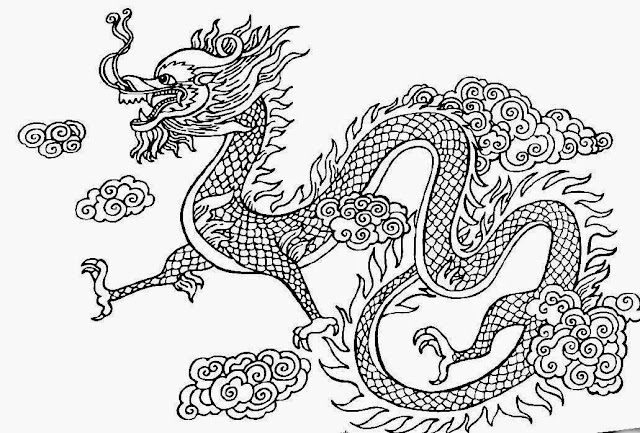 Initially, the dragon was benevolent, wise and just but the Buddhists introduced the concept of malevolent influence among some dragons. Just as water destroys, they said, so can some dragons destroy via floods, tidal waves and storms. They suggested that some of the worst floods were believed to have been the result of a mortal upsetting a dragon. Many pictures of oriental dragons show a flaming pearl under their chin. The pearl is associated with wealth, good luck, and prosperity. 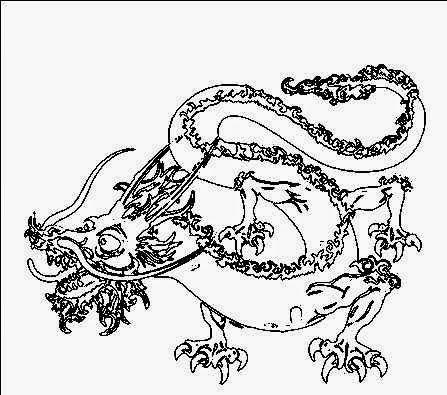 Chinese dragons do not have wings. Their abilities (to fly and control rain and water) are mystical. The dragon has also acquired an almost unlimited range of supernatural powers. 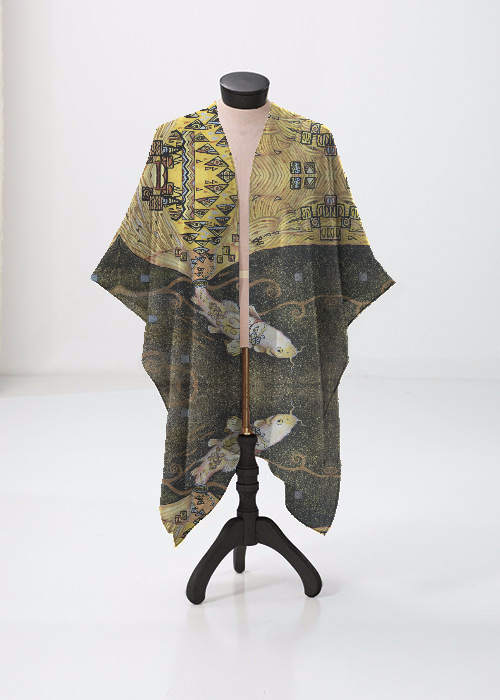 It is said to be able to disguise itself as a silkworm, or become as large as our entire universe. It can fly among the clouds or hide in water. It can form clouds, can turn into water, can change color as an ability to blend in with their surroundings, as an effective form of camouflage or glow in the dark (according to the Shuowen Jiezi). In many other countries, folktales speak of the dragon having all the attributes of the other 11 creatures of the zodiac, this includes the whiskers of the Rat, the face and horns of the Ox, the claws and teeth of the Tiger, the belly of the Rabbit, the body of the Snake, the legs of the Horse, the beard of the Goat, the wit (or brain) of the Monkey, the crest of the Rooster, the ears of the Dog and the snout of the Pig." 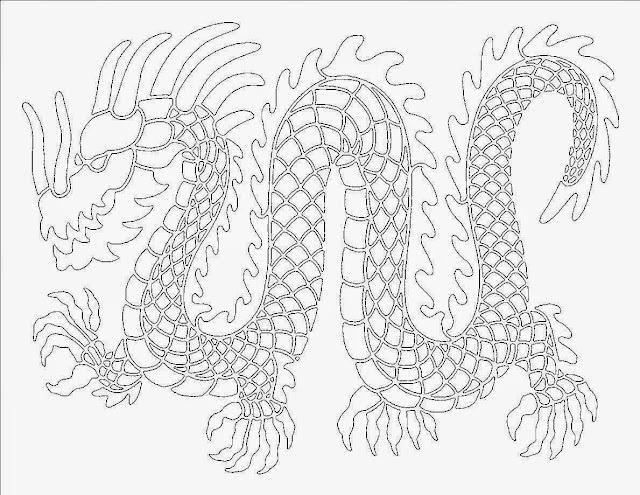 How to draw a Chinese dragon step by step. 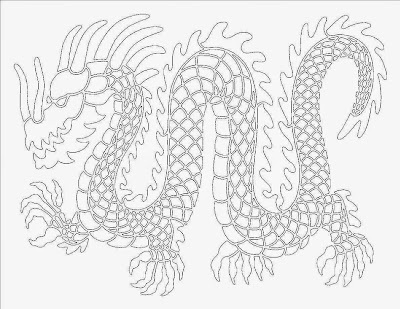 Once you have drawn this dragon, get creative and invent your own. Try starting with different types of curved lines to draw your dragons in different positions. It's an awesome idea! I like your blog, you've done a great job! Have lots of inspiration!